As civic and humanitarian services increasingly move from the public to the private sectors, service organizations like Rotary have become more relevant than ever. Many young leaders understand this and want to contribute their talents to improve conditions where they can. Rotary provides an opportunity to accomplish what no individual can do alone. Today’s Rotary is diverse, energetic, and nimble, and the Rotary family of members is fun and supportive. 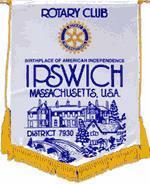 Chartered in 1923, Ipswich Rotary is in its 93rd year of community service to Ipswich and Rowley. Currently, 75 local business and community leaders provide services that improve lives at both international and local levels. These dedicated men and women support global initiatives including Rotary International’s campaign to eradicate polio worldwide (an initiative that is nearing completion), and international projects initiated by our own members. Our numerous community service projects include “Rotary Park”, adjacent to the Ipswich Family YMCA, and the Rowley Bandstand renovation which was completed prior to Rowley’s 375th celebration in 2014. The same year, a new school bus shed on County Road in Ipswich was completed through a partnership of Rotary, Ascension Church, and the Ipswich YMCA. More recently, Rotary has assumed maintenance of the 9-11 Memorial in Rowley, partnering with Rowley Gardens. In Ipswich, we restored the historic South Side Cemetery fence and entry arch and the gazebo at Rotary Park, and we helped renovate the new "Open Door" food pantry in Ipswich. We also made a $25,000 donation to the Ipswich Family Y to help them fund a major expansion in 2015-16. Youth based programs are a priority for the Rotary Club. Each year, Rotary gives out over $10,000 in scholarships to deserving graduates of Ipswich High School and Rowley graduates from Triton Regional High School. In partnership with the Ipswich School System, Rotary sponsors and supports service clubs at Ipswich High School and at Doyon and Winthrop Elementary Schools. The Interact Club at Ipswich High School has been recognized consistently by the President of Rotary International for its achievements. Their annual “Jingle Bell Walk” has become a community tradition in Ipswich. Each year, Rotary also sponsors a student exchange program, sending a local student to study abroad for a year and hosting a foreign student at Ipswich High School. Senior citizens and those in need also benefit from Rotary programs. The club works with the Ipswich Council on Aging to provide “Lend-A-Hand” small chores assistance and the annual “Senior Lunch”. Four times a year, Rotarians prepare and serve delicious meals at the “Ipswich Dinner Bell” on Monday evenings at the Masonic Temple. Rotary also actively supports many community based humanitarian initiatives, including the Ipswich and Rowley Food Pantries and Ipswich Caring. This year, Ipswich Rotary and our Rotary District will begin a broad “Homelessness and Hunger Initiative”. Funding for these projects and programs comes largely from the community through several fundraisers. Currently, these include our annual Masquerade Ball at Turner Hill Mansion and the “Rotary Half Marathon" road race along rustic country roads from Castle Hill. The mission of Rotary International is to provide service to others, promote integrity, and advance world understanding, goodwill, and peace through its fellowship of business, professional, and community leaders. Our motto is “Service Above Self”, and our guiding philosophy is “Doing Good in the World”. For Rotarians, “Service Above Self” is more than just volunteering; it is a lifestyle that guides us every day as business and community leaders, friends, parents, and family members. Join us and make a difference. We invite civic minded leaders throughout Ipswich, Rowley and Georgetown to join us in our mission of "doing good and changing lives". Contribute your special talent as we do good work and have great fun. Be our guest at an upcoming meeting. Ipswich Rotary meets Thursday mornings at 7:15 AM in Rowley at the Village Pancake House. You also can follow us on Facebook.